Sen. Elizabeth Warren, D-Mass., sent letters accusing banking and housing regulators of rolling back fair housing protections for people of color. Democratic Sen. Elizabeth Warren sent letters Tuesday to federal banking regulators and Secretary of Housing and Urban Development Ben Carson, accusing them of rolling back anti-discrimination protections for people of color in the face of a wave of modern-day redlining. The letters were the latest salvo from the Massachusetts senator, who has taken up the issue of redlining in the wake of a February investigation from Reveal from The Center for Investigative Reporting, which found that in 61 metro areas across America, people of color were far more likely to be denied a home loan than their white counterparts, even when they made the same amount of money and wanted to take on the same size loan and buy in the same neighborhood. Since taking office, Carson has delayed implementation of fair housing rules promulgated under President Barack Obama, nixed his department’s prosecution of major anti-discrimination cases and proposed removing the words “free from discrimination” from the agency’s mission. “Housing discrimination remains a serious problem in the United States,” Warren said in her letter to the nation’s top bank regulator, Comptroller of the Currency Joseph Otting, citing Reveal’s report. 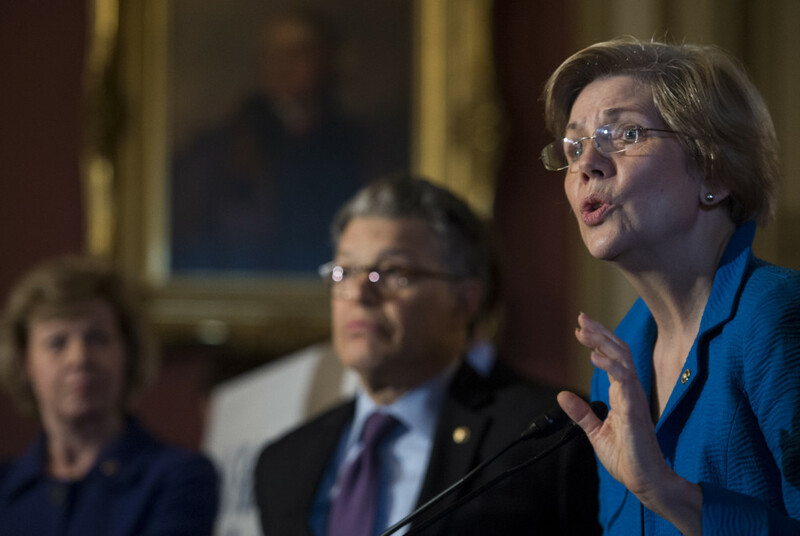 Warren sent similar letters to Federal Reserve Board Chairman Jerome Powell and Martin Gruenberg, chairman of the Federal Deposit Insurance Corp., expressing concern about a new Treasury Department report that proposed a plan to “modernize and improve” the act. In her letters, she asked the banking regulators to detail any meetings with “lobbyists or representatives of the banking or financial services industry” that they’ve conducted while revising Community Reinvestment Act enforcement rules. Warren’s effort is one of a number of attempts by congressional Democrats to push the Trump administration into taking a tougher stand against redlining in the wake of Reveal’s reporting. On March 29, Sen. Bob Casey of Pennsylvania and Pennsylvania state Sen. Vincent Hughes wrote to Attorney General Jeff Sessions, demanding a Justice Department investigation. Two weeks later, the Justice Department had not responded to the letter. Department spokesman Devin O’Malley declined to comment or even acknowledge receipt of the request. In the House, Democratic members of the Financial Services Committee have asked for hearings but have not gotten a response from the chairman, Republican Jeb Hensarling of Texas. In the meantime, they have entered Reveal’s story into the congressional record and grilled Powell and the Federal Reserve’s vice chairman for supervision, Randal Quarles. Last Tuesday during Quarles’ semiannual testimony before Congress, the ranking Democrat on the Financial Services Committee, Rep. Maxine Waters of California, cited another of Reveal’s findings, that 99 percent of banks had passed their Community Reinvestment Act tests with a satisfactory or outstanding grade. “Would you agree that the CRA test was not vigorous enough?” she asked Quarles. Another member of the committee, Rep. Keith Ellison of Minnesota, followed up, calling continued redlining “absolutely unacceptable” and asking Quarles whether he “had any specific things” in mind to improve enforcement. Quarles said he did but would not share it with the committee because potential changes still were being discussed in closed-door meetings with other regulators. Quarles said he did but would not share it with the committee because potential changes still were being discussed in closed-door meetings with other regulators. Aaron Glantz can be reached at aglantz@revealnews.org. Follow him on Twitter: @Aaron_Glantz.